Thanks to a growing number of use cases — from failover to Parallel Networks, M2M-IoT, and primary WAN connectivity — the popularity of 4G LTE as a cost-effective network is on the rise, no matter what size the business. However, a new trend is emerging, combining LTE and Software-Defined Networking (SDN). 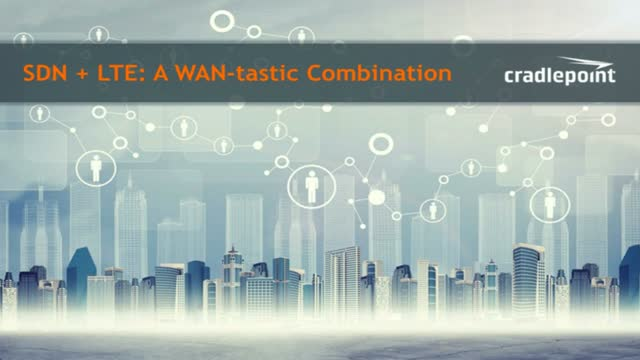 This trend is enabling the WAN to be as pervasive as today’s wireless LAN. Join Cradlepoint’s Todd Krautkremer (SVP of Strategy) and renowned industry analyst Dr. Jim Metzler for a discussion hosted by SpiceWorks on how 4G LTE and SDN will enable enterprises to do more by wiring less.